Beauty Costs > Tattoo > How Much Does a Wedding Band Tattoo Cost? How Much Does a Wedding Band Tattoo Cost? Aside from the conventional wedding ring, a wedding band tattoo is a tattoo some people choose to help remember the day of their wedding, and in addition to the pictures and videos, this tattoo is a great way to look back on the commitments made. Wedding band tattoos provide couples a more permanent display of their bond since the tattoos are inked their skin and can only be removed by certain medical procedures. Like any tattoo, the designs are endless. 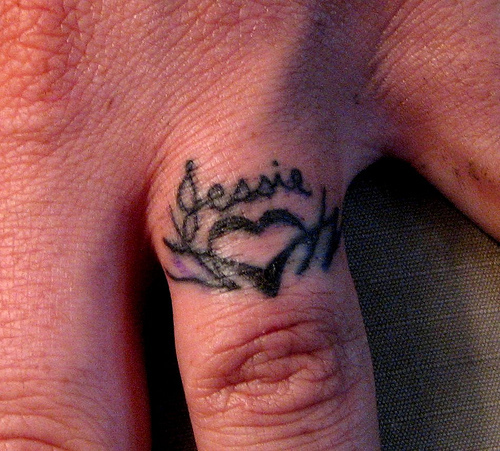 The price of a wedding band tattoo will depend on the artist, design and geographical location. On average, this tattoo can cost anywhere from $50 to $300 depending on the artist rendering the tattoo as well as the complexity of the design. For example, Sunset Strip Tattoo, a tattoo studio, says a small tattoo such as a wedding band can cost anywhere from $50 to $100 depending on the complexity of the design. Purple Panther Tattoos, another professional studio located in Hollywood, notes a simple wedding band tattoo can cost anywhere from $60 to $200. The Knot says a wedding tattoo can cost anywhere between $50 to $2,000, even for the most complex design. Before the process begins, the artist will meet with the couple, or in some case, the individual who wants the band. He or she will be able to draw up a drawing rendering on what it’s going to look like on your hand, and this can either be customized or simply from a design you may have found online or in a book at the studio. The entire process, including the tattoo, shouldn’t take any more than two to three hours. Designing, depending on the complexity, should take about an hour or so since the area is so small. While an artist can put just about anything on your finger, the most popular designs include Celtic rings, simple line designs, letters and simple shapes such as a heart. Your initials or each other’s names. Matching Celtic knots or Celtic band patterns. The wedding date in Roman numerals or simply as numbers. The word “love” in your native language. A diamond resembling a wedding ring or even a simple wedding band. A lock and a key. A “halfsies” tattoo that connects when you put your knuckles together. A theme of something you enjoy, such as Star Wars. An idea/design related to your religion. An ointment/lubricant cream will be required after the tattoo has been completed and is highly recommended to keep the healing layer of the skin moisturized. This may be included in the quote or could cost a few extra dollars. This ointment will have to be applied for the next couple days to prevent an infection from occurring. It’s so important to follow the aftercare instructions to avoid your tattoo from drying out. This also means using a fragrance-free moisturizer afterward and avoiding any contact for a few days after. Due to the fading, plan on having the tattoo touched up every five to seven years. According to some experts, the skin on your finger is known to be thin, and because of this, it’s not ideal for a wedding band tattoo. Since the underside of the finger won’t hold ink for long, some may only have the tops of their finger tattooed, not around the entire finger. In fact, what you may find is that some artists may avoid doing them altogether based on the fading issue alone. The Alternative Bride says that if you want to avoid fading, it’s best to choose a darker ink or a simple design. If you’re not sure if you would like a tattoo on your finger, consider a henna tattoo first to see if it looks good. A henna tattoo can greatly resemble a real tattoo but will disappear after a few weeks. Trends always change, so if you’re thinking about getting a new tattoo, make sure it may be relevant 20 years from now. People who often get a wedding ring tattoo will either get their significant other’s initials engraved or will get a simple dark brand wrapped around their finger. No matter which design you choose, try to stick to a simple shape or line to avoid a “blurry” appearance. Blue and black tends to be the most popular color since they don’t fade as fast as others. You don’t need to choose a design at a tattoo studio as most talented artists will be able to put anything they see on paper onto your finger. Consider using Pinterest, Google Images or blog posts such as this one for inspiration. According to Bustle, a finger tattoo, regardless of where you’re getting it tattooed, is going to hurt. Since your fingers are full of nerves and the skin lays on the knuckle and bone, this area won’t have as much fat when compared to other parts of your body. With no fat, there will be, unfortunately, no cushion to support the needle. After it’s done, plan on having a sore finger for up to a week before it feels normal again. For most tattoos, artists recommend keeping it simple if you want to get one. In general, line art and letters will look good, but most will advise you to steer clear of images and designs since the ink can break apart of even bleed, making it hard to distinguish what the image actually is. Some tattoo establishments offer unique promos to attract new customers. Yelp and their official website may list current promotions you could take advantage of. You could also ask family or friends for a recommendation. Regardless of who you choose, always make sure they have experience with ring tattoos, not just any tattoos, and always take a glance at their portfolio of their work to see what they are capable of doing. Never feel pressured to get a tattoo or choose one based on the price.